Welcome to the 2019 King Clancy Cup and 2019 Founders Cup. The King Clancy Cup is open to non-playoff “A” teams from the GTHL and MHL as well as non-playoff “AA” and “AAA” teams from the GTHL. All other teams must receive approval from tournament officials. Teams from the OMHA should refer to the eligibility chart below for additional information. 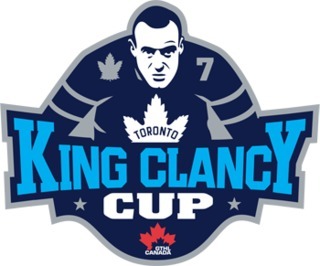 Visit the King Clancy website to register. The Founders Cup is open to GTHL and MHL “A”, “AA” and “AAA” teams eliminated from the first round of the playoffs. All other teams must be cleared by tournament officials. Please refer to the eligibility chart for more information. Visit the Founders Cup website to register. Unsure of your eligibility? Please see the eligibility chart below prior to visiting the registration page. York Simcoe – Teams losing in first round of YS Playoffs Lakeshore – Teams eliminated in 2nd round of Lakeshore Playoffs. OMHA Lakeshore – Teams losing in first round of OMHA Playoffs. All Playdown teams are ineligible. York Simcoe – Teams losing in first round of YS Playoffs. All Playdown teams are ineligible Lakeshore – Teams eliminated in 2nd round of Lakeshore Playoffs. OMHA Lakeshore – Teams losing in first round of Playdowns + Pickering Panthers. York Simcoe – Teams losing in first round of YS playoffs Lakeshore – Teams eliminated in 2nd round of Lakeshore Playoffs. OMHA Lakeshore – Playdown teams are ineligible. Teams losing in the first round of the Lakeshore Playoffs are eligible. York Simcoe – All YS Playoff Teams Lakeshore – Teams eliminated in 2nd round of Lakeshore Playoffs. OMHA Lakeshore – Teams losing in the first round of the Playdowns + Peterborough and Pickering. York Simcoe – Teams losing in the first round of YS Playoffs. Playdown teams are ineligible. Lakeshore – Teams eliminated in 2nd round of Lakeshore Playoffs. OMHA Lakeshore – Playdown teams are ineligible. Teams losing in first round of OMHA Playoffs are eligible. York Simcoe – Playdown teams are ineligible. Teams losing in first round of YS playoffs are eligible. Lakeshore – Teams eliminated in 2nd round of Lakeshore Playoffs. OMHA Lakeshore – Teams losing in the first round of the OMHA Playdowns and all Series H teams in OMHA Playoffs. York Simcoe – Playdown teams are ineligible. Teams losing in first round of YS Playoffs are eligible. Lakeshore – Teams eliminated in 2nd round of Lakeshore Playoffs. OMHA Lakeshore – Playdown teams are ineligible. Teams losing in first round of Lakeshore Playoffs are eligible. York Simcoe – YS Playoffs Series F teams are eligible. Teams losing in first round of OMHA Playdowns are subject to review. Lakeshore – Teams eliminated in 2nd round of Lakeshore Playoffs. OMHA Lakeshore – Whitby White + teams eliminated in first round of OMHA Playdowns. YS – Playdown teams are ineligible. Teams losing in first round of YS playoffs are eligible Lakeshore – Teams eliminated in 2nd round of Lakeshore Playoffs. OMHA Lakeshore – OMHA Playdown teams are ineligible. Teams losing in first round of Lakeshore Playoffs are eligible. York Simcoe – OMHA Playdown teams are ineligible. Teams losing in first round of YS Playoffs are eligible. Lakeshore – Teams eliminated in 2nd round of Lakeshore Playoffs. OMHA Lakeshore – 9th and 10th place teams + teams losing in the first round of Playdowns. York Simcoe – Teams losing in first round of York Simcoe Playoffs. Subject to review Lakeshore – Teams eliminated in 2nd round of Lakeshore Playoffs. OMHA Subject to review Lakeshore – Teams eliminated in 2nd round of Lakeshore Playoffs. OMHA Lakeshore – Teams losing in first round of Playdowns unless Ajax or Quinte loses. Ajax and Quinte will be eligible for Founders if they lose in first round. York Simcoe – Playdown teams are not eligible. Teams losing in first round of YS playoffs are eligible. Lakeshore – Teams eliminated in 2nd round of Lakeshore Playoffs. OMHA Lakeshore – Playdown teams are not eligible. Teams that lose in first round of Lakeshore Playoffs are eligible. York Simcoe – Playdown teams are not eligible. Teams who lose in first round of YS Playoffs are eligible. Lakeshore – Teams eliminated in 2nd round of Lakeshore Playoffs. OMHA York Simcoe – Teams that lose in first round of Playdowns Lakeshore – Teams eliminated in 2nd round of Lakeshore Playoffs. OMHA Lakeshore – All non Playdown teams. York Simcoe – Losing teams from first round of Playdowns minus 1st and 2nd place teams Lakeshore – Teams eliminated in 2nd round of Lakeshore Playoffs.